Milos also participated in the environmental awareness campaign Keep Aegean Blue, a collaboration of Region of South Aegean with “All For Blue”, which is the biggest mission for educational programs about ocean conservation and beach & underwater cleanups. More than 436 kg of trash was removed from the beach, Papikinos in Adamas, Milos island, where the beach and underwater cleanup took place on Wednesday, April 4th. With the presence and contribution of the South Aegean Regional Governor Giorgos Hatzimarkos and the coordination of the team by Katerina Topouzoglou, founder of All For Blue. 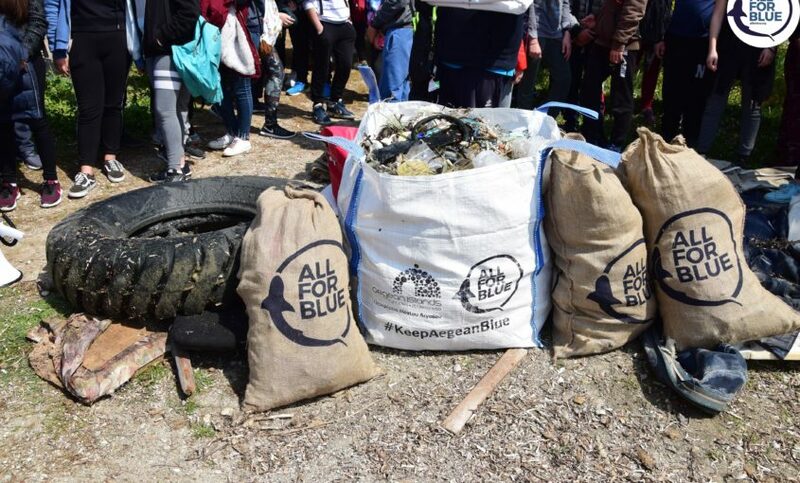 110 students of the B and C classes of the Gymnasium and professional divers participated in the cleanup of the beach and the ocean, during which they removed about half a ton of trash, including an old boat, a tractor wheel, chair, tires, irons , various plastics and other items. The action was accompanied, as always, by the environmental seminar, which took place in the boardroom of the Milos Municipal Council. The seminar was attended by Gymnasium students as well as environmental-aware citizens on the importance of protecting the marine ecosystem and all received a diploma of participation from the international organization. The upcoming actions of “Keep Aegean Blue”, continues with the following islands: 4 April Naxos, 5 April Syros, 16 April Andros, 17 April Tinos, 18 April Mykonos, and 8 May Karpathos.